Baked in foil potatoes - delicious, lean and very healthy dish. With this method of cooking the tubers stored vitamins and minerals, and the potato turns out tender and crispy. It can be a separate dish for lunch or dinner or serve as a garnish for meat, fish or poultry. How to cook potatoes in "potato crumbs"
For baking suitable potatoes of any variety. Choose young, smooth tubers without damage and wormholes. Before cooking they should be washed thoroughly with a brush and dry with paper towel. 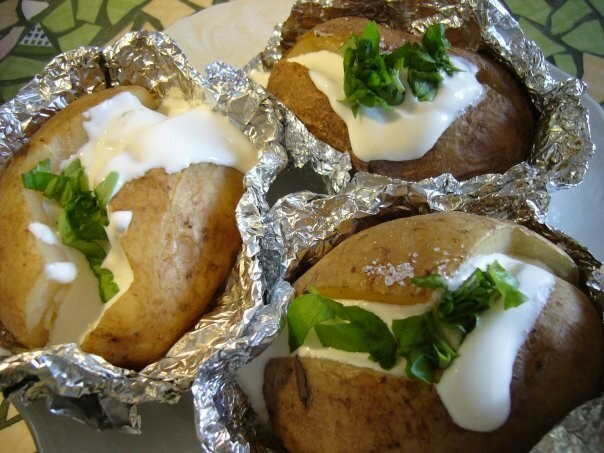 Very fast and easy preparing baked potatoes with sour cream sauce. Select small potatoes of the same size. Each tuber brush with vegetable oil. From a sheet of foil cut out small squares and wrap each tuber in a neat bundle. Place rollups in pan or grill and place in oven, preheated to 200 ' C. Bake the potatoes for 40-50 minutes. While the potatoes are ready, make the sour cream sauce. Chop chives, dill and garlic pickled cucumber cut into very small cubes. Put the greens in a small bowl, add sour cream, salt and freshly ground black pepper. Stir the mixture until smooth and pour it into a sauceboat. Get ready, the tubers from the oven, unwrap the foil and cut each potato crosswise. The cut put a piece of butter. Serve the potatoes hot, watering the prepared sauce. Try another version of baked potatoes. Thoroughly washed tubers peel and cut lengthwise into two halves. Lightly pepper and salt. Bacon cut into thin slices. Cut foil into squares by the number of potatoes. In the middle of each square place half of the tuber, on top place a slice of bacon, cover it with second half of potatoes. Put another strip of bacon and wrap each portion in foil. Convolution with stuffed potatoes lay on a baking sheet and place in preheated oven. Roast them for 30-50 minutes (cooking time depends on the size of tubers). Before serving, unwrap the foil and place the potatoes on a dish. On request it can be sprinkled with finely chopped parsley and dill.